Connor Truby I think, vs. Peter Ryding? Here are the balance of the photos that I've been given from Saturday's To the Strongest! Worlds. Gareth Purchon vs. Barry Lee. I fought Garreth, later in the day, a tough and resilient opponent! Peter Ryding, right, vs. ? Looks like a nice compact line with a refused flank guard. I'd hazard that Peter outscouted his opponent and decided to kill one flank. My own light cavalry crossbowmen- did invaluable service. It's really important to be able to disorder some opponents before committing the knights. They died to a man in the last game. Me vs.Peter Anderson's LAter Acaemenids. An enjoyable game, with several reverses of fortune- I got lucky! 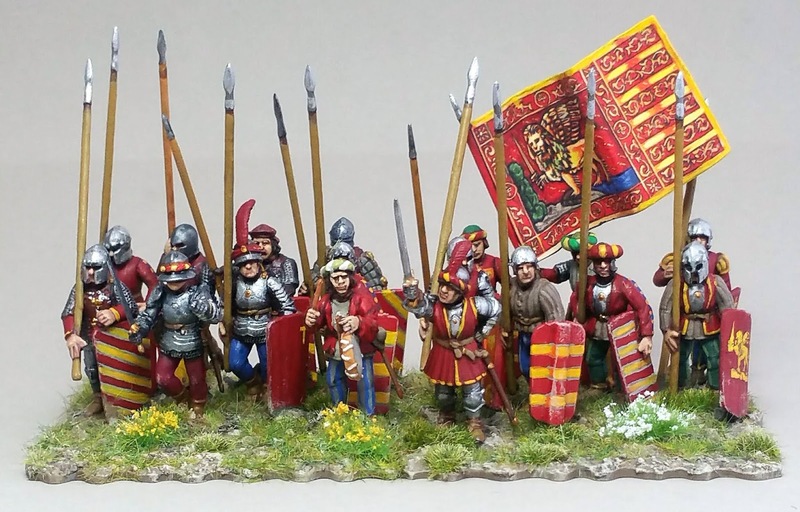 I think that's Howard Litton's Polybian Roman army (ex mine). I think Howard came second overall, which is remarkable in only his second tournament. Howard came all the way from the Isle of Arran. Sorry, I can't make out the opponent. We had the hall pretty much filled this year- might need to apply some creative thinking next year. On the upside, though, I can announce that bookings have just opened for a new one-day tournament, "Knight Fever", as part of the London Games Tourney on Sunday September 15th. This will be purely for armies form the three Medieval Books- if you don't have an army, but want to come, please mail me- or spend £60 with those nice Perry brothers and you'll be sorted in no time! Details are here- it's a Chalgrove-style event, it'll be fixed terrain for round 1 and optional terrain placement thereafter. Apparently there are plenty of places and lots of free parking. This is where you can book. 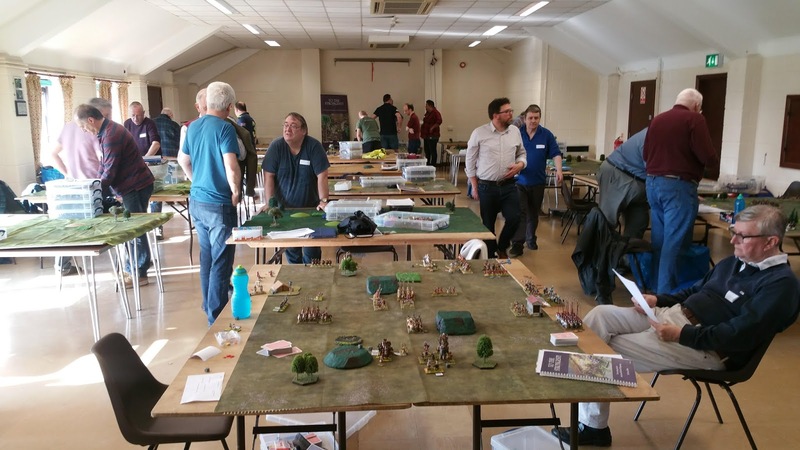 On Saturday, we enjoyed a fabulous day of gaming at this years To the Strongest! World Championships, hosted by the South Oxfordshire Generals, in Chalgrove. This year we had 41 players who played an incredible total of 80 games between them, most are in the group photo, above. That's Steve Dover in the front who organised it, with help from myself, Tim Thompson and the South Oxfordshire Generals. Here are some photos of the games, in no particular order, that have kindly been sent to me by Jason Collis, Jimmy Carter and Tim Thompson (along with a few of my own). All photos will enlarge if clicked. Apologies if I missed your name or got it wrong! Lunchtme- the weather was glorious! A pensive Andrew Brentnall, who went on, with great good humour, to win the Dead Elephant award. Shaun Jewitt- 100 Years War English. What a neatly laid out table! John Sharman and Khan Baz scanning the rules! Rachel Winter- beat me last year, I gather she did well this year, too, but have no details yet. This is a Civil War between two Later Italian Condotta Venetian armies. Small World! Must be Jan de Neve, and Colin Hoare. 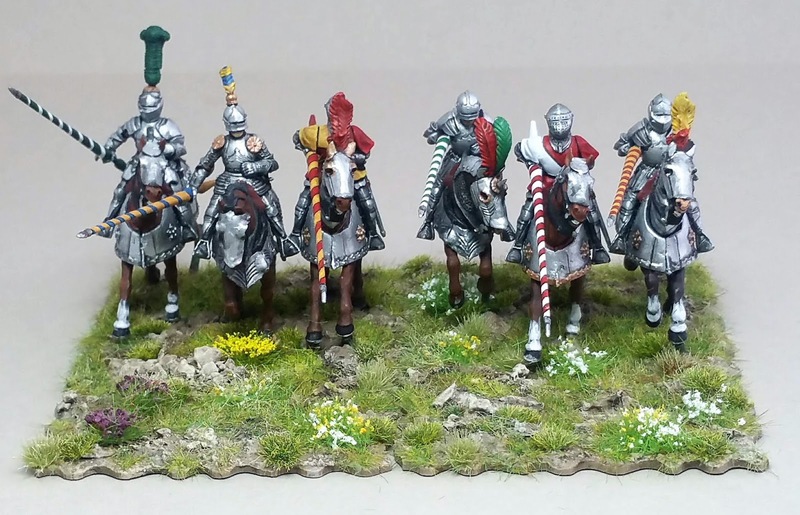 There were three Italian Condotta armies, including mine; this year knights are the new nomads! Parthians, perhaps Peter Ryding's, vs. Romano British, perhaps Nick Abbott's? That's all for now. Tomorrow I'll post the balance of the photos- lots more in-action shots! 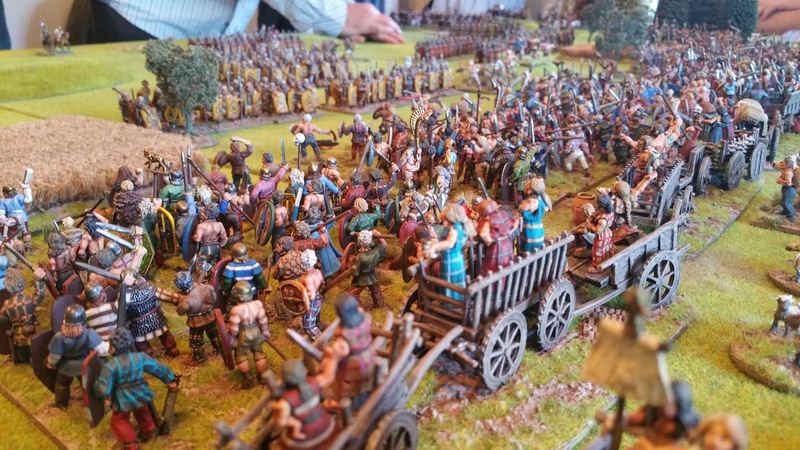 The rules used were, of course, To the Strongest v1.1a rules, with the Even Stronger v.7c amendments and 130 point armies. 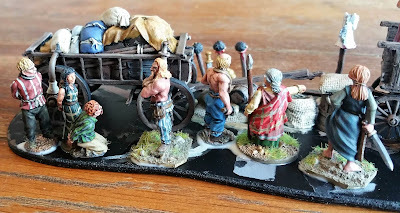 Later this week, we'll post a list of the armies..
Last night, I finally managed to finish the basing of my army for Chalgrove, the To The Strongest! World Championship, on Saturday. I've photographed all eleven units. Above are the Famiglia Ducale Elmeti, the household of the Duke of Milan. All minis are Perrys, the above were by painted myself and Lionel Béchara, with the flags from Pete's flags on eBay. N.b. all photos will enlarge if clicked. Here are some Italian later knights, again by Lionel, who did superb barber-shop lances.All the bases are my famous magnetic wobbly-edged BatBases. More later knights, again from Lionel. I gave these deeper bases to protect the lances. 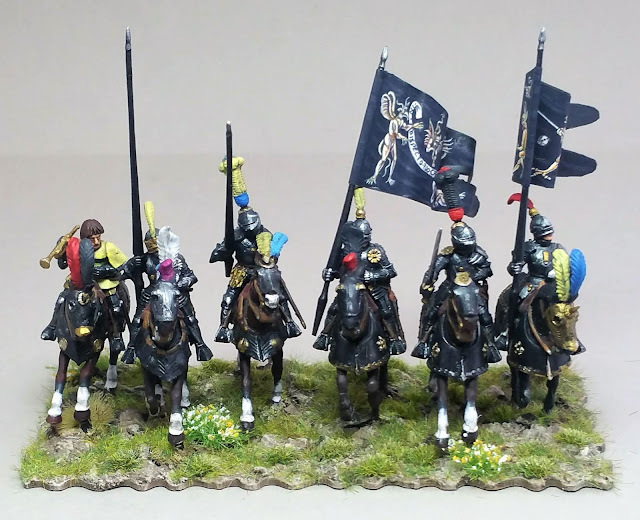 Above, yet more later knights, painted by Richard Hampson-Smith. 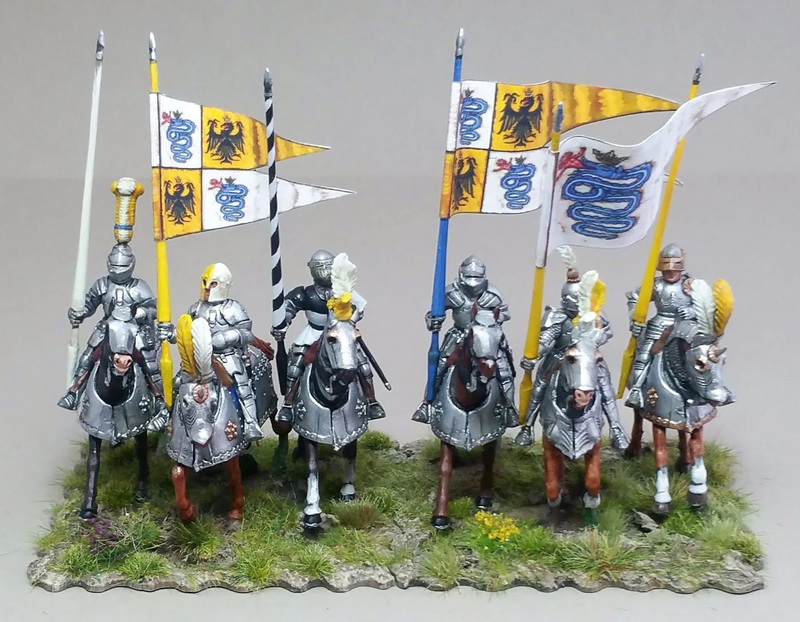 The standards are for the Bande Nere; I suspect that there may not have been many (or even any) such knights, but the standards are too good not to use. 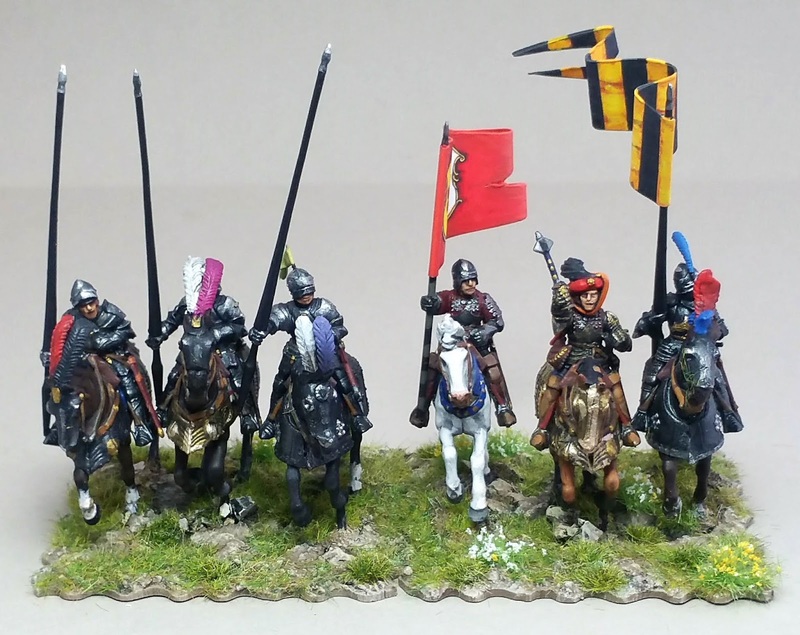 Here is Giovanni delle Bande Nere, himself, with the last (fifth) unit of later knights. Interestingly it appears that the famous black bands may only have been so-named after his untimely, cannon ball-related demise. 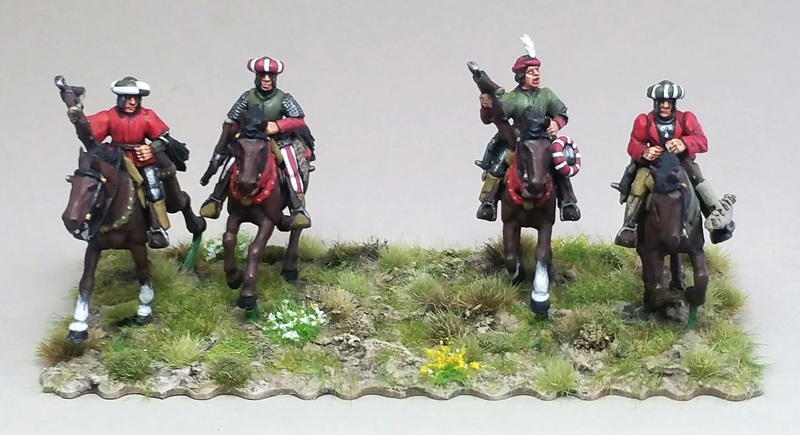 Mounted crossbowmen ex Richard. The various lights will likely screen the advance of the knights. More mounted crossbowmen, ex Richard. Even more mounted crossbowmen, ex Richard. 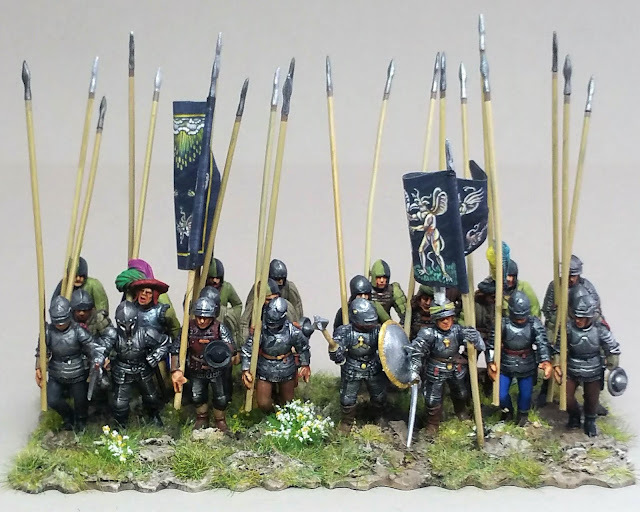 Metal light infantry crossbowmen, from a chap in Sweden. Formed crossbowmen; again re-touched and re-based minis, originally painted by Richard. I'm not quite sure what I'll do with these, yet; possibly a refused flank for the knights. 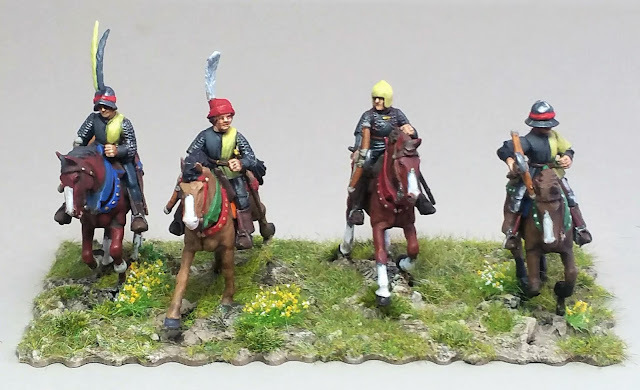 My favourite unit- Venetian spearmen painted by Richard Hampson-Smith, Shaun McTague and myself. These are raw, and likely to be used to garrison the camp. I'm aware that I need to separate the tails on the flag. Above is the army list; it's not an especially subtle army but should do well-enough in a dead-on clash. 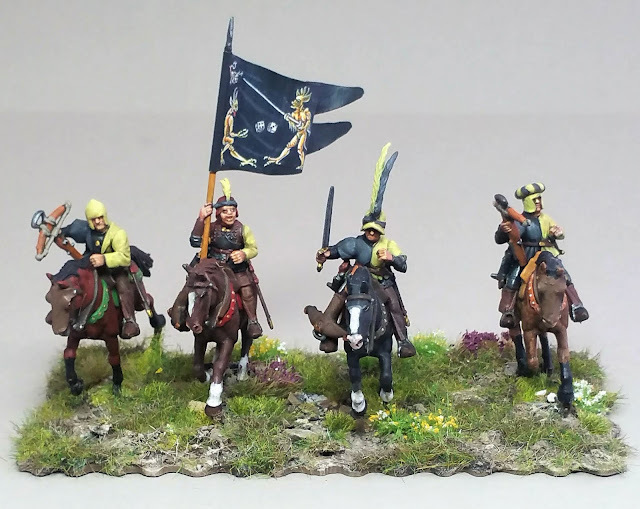 As the army is entirely newly-painted, and I've not had time to play a game since November, I am not especially optimistic about my own prospects, but I aim to have fun! 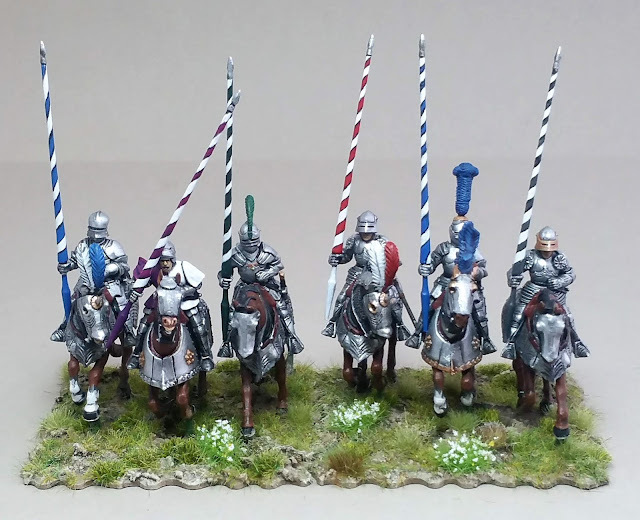 Finally, here's a bonus unit, of Bande Nere pikemen. 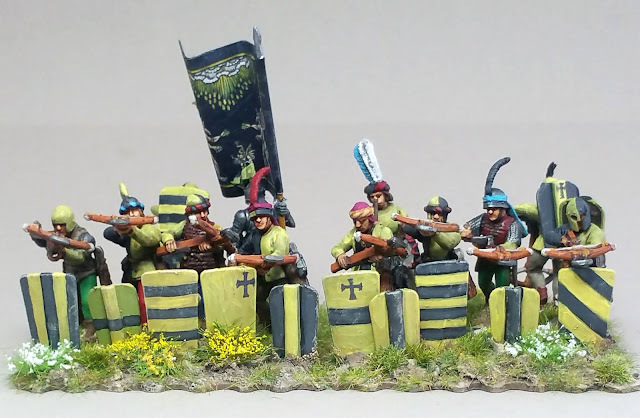 Unfortunately I didn't have enough points to use them, this time, but I plan to add supporting arquebusiers, post-Salute. I love the grim look of them. So there we are, all done! Can I take this opportunity to wish safe journeys to all forty-odd players who are attending the tournament, especially the brave Belgians and Howard who is coming down from the Scottish Isles! May none of your cards be Aces (except when playing me, that is. ;-) ). With the Worlds on Saturday, I am making the final push on finishing my army. Here it is, pre flocking; I decided to lighten the base tone before covering most of it with flock (go figure!!). This morning I am sitting in a sunny dining room, with Lynyrd Skynyrd blasting in my ear, applying flock. Life is good! Not the best photo, but this is finished. This gives me four foot of wagon laager for my Salute Mancetter battle. I'd like eight foot, but four will have to do for now! You can see the rest of the laager, which was painted in 2015, here. I've made good headway this week with the Mancetter 61 CE project, for Salute. I now have 70% of the required minis on the new-style bases. 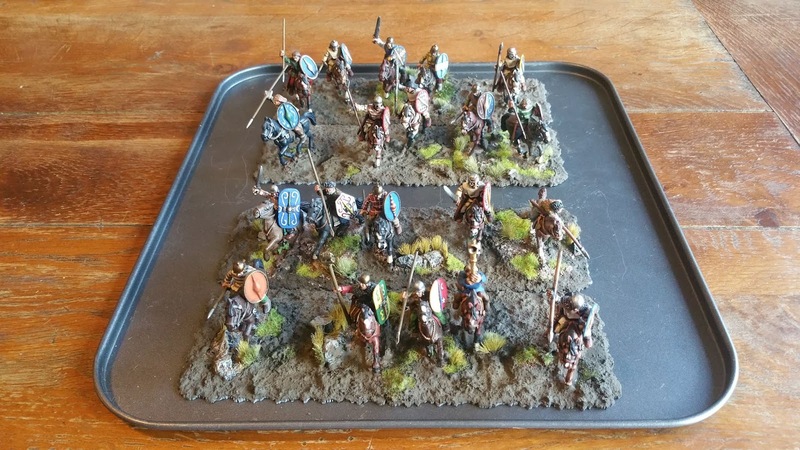 The main outstanding requirement is for three more trays-worth of the warbands (above, front). I have 2/3 of the 310 required minis painted and Shaun McTague is plugging his way through the remainder. The image above doesn't show the chariots or the wagon laager, which are largely complete. I think I am broadly on-target- although there's a heck of a lot of grouting and flocking to come! 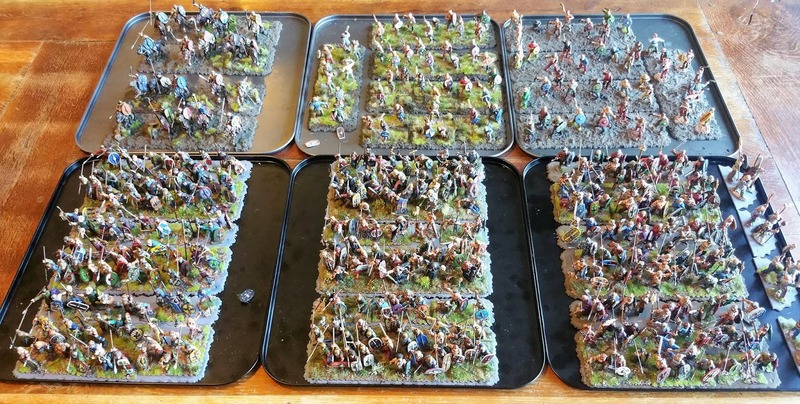 There should be rather more than 800 Celts by the time I am finished, 12' of warbands and 12' of light troops. Below is a shot of an earlier incarnation of the Celtic army, with their Roman opponents in the distance. I'll be running the large Mancetter "To the Strongest!" 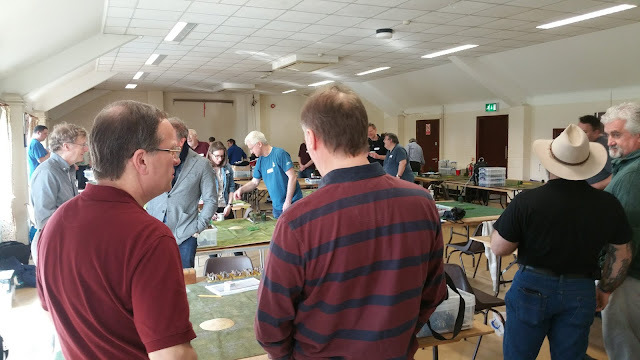 participation game at Salute. If you'd like to play in one of the two 2-hour sessions, please email me at the address (above, left) and I'll book you in. Last night I decided to make a start on the main basing effort for Salute- the warbands. Here are the first six. 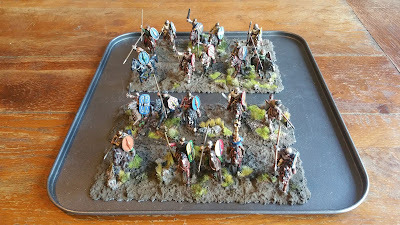 These first units will be relatively quick wins because I'm re-basing my existing Celts onto larger bases- each unit will eventually have c.24 minis on the front base, and c.12 on the rear base- I've not yet put the rear rank miniatures on the base. The bases are from my 20cm set, the TtS!20F and the smaller TtS!20G that fits behind it. Since each unit will be on only two bases, they will be quick to deploy and easy to move. The process is to slice the top layer off my current cardboard bases, carefully, with a sharp craft knife, and then stick this layer (grout and flock intact) onto the prepared bases (chamferred edges, with fitted magnets and primed). Next I'll fill in the rear ranks and get another three units on bases. After this, the task becomes harder as I still have minis that need finishing and they are all singles. I hope that I will have enough minis to build 17 units, altogether- around 11' of frothing warriors!